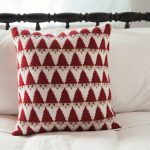 Have you noticed how trends go, first it’s clothing, then it’s home decor and Christmas decorations are soon to follow. 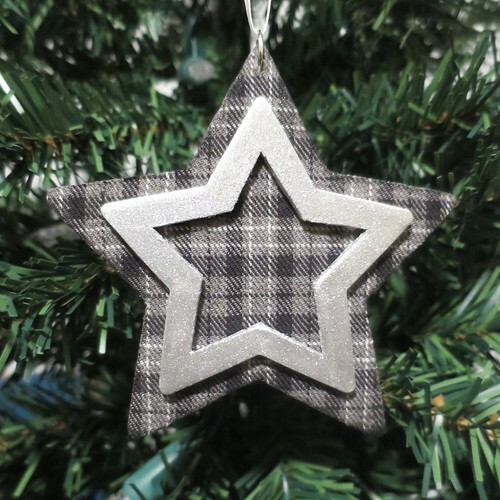 This ornament takes the current plaid trend to the tree. 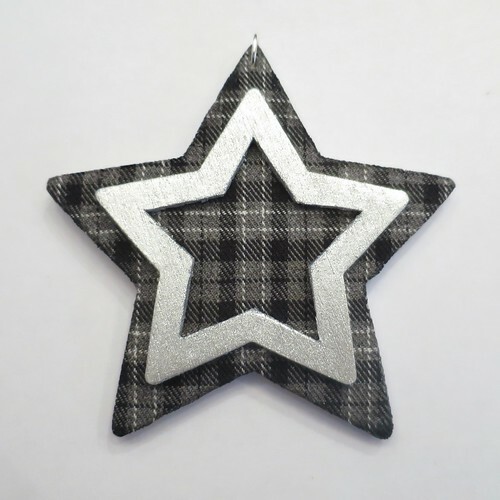 I think this ornament has such a nice tailored look, especially in the black, grey and white plaid I used. 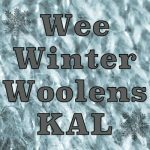 You can do this ornament in two ways, leave the middle open to show off the plaid like I did or use the center to show off a photo. I cut out the center of the smaller star for this project. 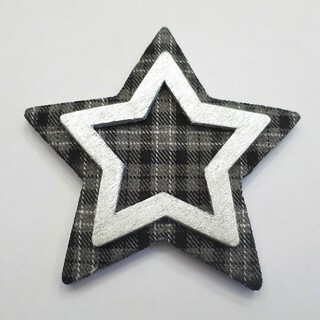 It wasn’t that hard, but if I could have found a wooden star already cut out like this I would have bought it. 1. 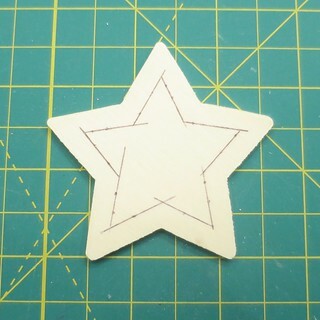 On the back of your smaller star use the ruler and an draw the out the lines to cut out the center of the star. I left a 1/4″ border on mine. 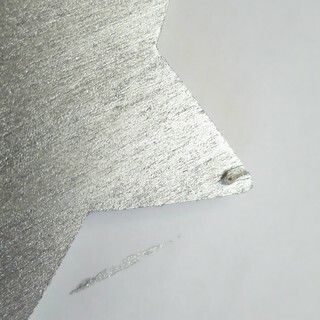 Using a box cutter, which is what I did, or a sharp exacto knife cut out the center of the star. 2. 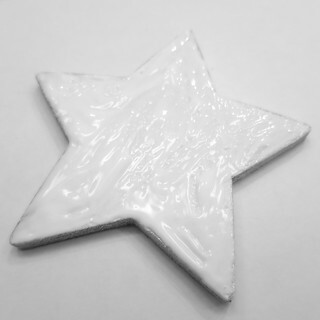 Paint the front and sides of the smaller star and the back and sides of the larger star. It might take more than one coat to get the color deep enough. 3. 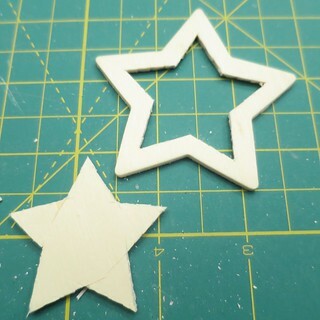 Cover the front of the larger star with an even coat of glue. Make sure to get all the way to the edges. Place down on the back side of the plaid fabric. (It is worth thinking about how the plaid will layout on the start when you do this. For example, I made sure one of the stripes was centered through the top point of my star. Let dry completely. With the small scissors cut the excess fabric. I then put a little glue on the edge of the fabric to make sure they were completely secure and wouldn’t fray. 5. Drill or hammer a small hole through the top point of the star. Make sure it isn’t too low for your jump ring to fit, but also don’t go too close to the top or the wood might split. Drill or hammer from the side with the plaid facing you. 6. Now, you have a choice to make. 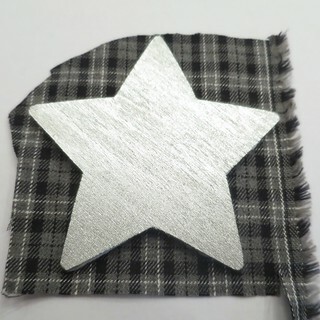 You can glue the smaller star in place on top of the larger one and leave the plaid showing. Or you can add a photo. 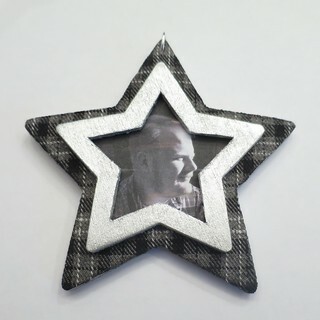 Print out a photo that is large enough to fill the opening in the center of the small star. 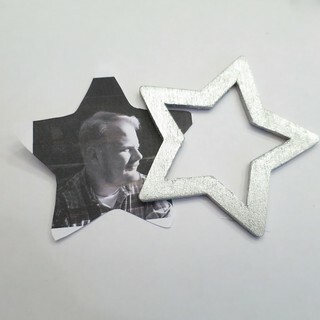 Use the star as a pattern to trace its shape and cut the photo to fit behind it. 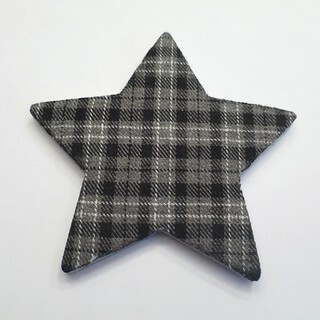 Glue the picture to the back of the star and then glue it in place on top of the plaid star. 7. 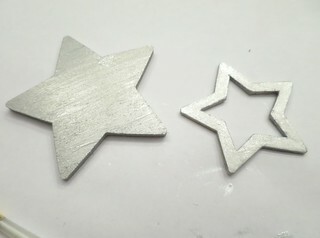 Open the jump ring and put it through the hole at the top of the star. Close it. Add a ribbon or hook for hanging. Another one of my favorites. Younknow how I love plaid. Well done. … You know … Stupid fat fingers here. I am with you on the plaid love…you would think the catholic school uniform would have knocked that out of me.